We are engaged in offering Eyebrow Piercing Services. Care must be taken not to interfere with nerves immediately beneath the eyebrow. The permissible depth of piercing will depend on the individual, but it is unlikely to be more than about 10mm. The healing period is about two to four months, although eyebrow piercing is frequently rejected by the body. We bring forth our vast industrial experience and expertise in this business, involved in offering a high-quality range of Eyebrow Piercing. 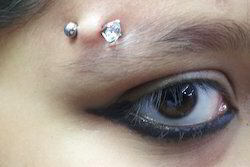 We are engaged in offering Beauty Parlour Eyebrow Piercing. 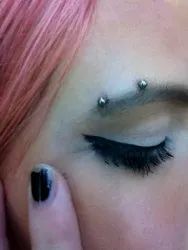 We are engaged in offering Beauty Parlor Eyebrow Piercing. We are a top-notch organization, engaged in providing Eyebrow Piercing.